Megalith Games is showing off some 3D renders they've made for the Sons of War. ...and the word is WAR! Behold the Sons of War! 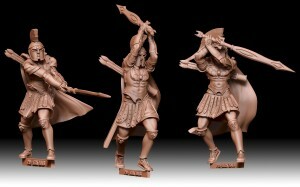 Just to whet your appetites we are previewing a sneak peak of the sons of War miniatures for GODSLAYER. As Temple Warriors of the God of War, the Sons of War are the apex of martial might. Skilful, fast, and powerful they are the ultimate killing machines, and these great 3D sculpts capture their ferocity and impressive panoply.